MAD World is a classic arcade game features challenging physics-based gameplay. More than 200 levels require skill, logic to save engaging characters. The aliens from Candy Planet are taking their UFO to conquer the MAD Planet. And the only chance to take the MAD Planet back is working with one of leading roles “ Daniel“ to pass through a serious of challenge. Simply intuitive game control. By tapping the screen, Daniel will be launched as a bullet to hit the target and save his friends. 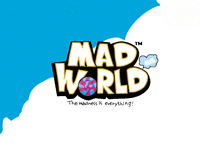 MAD World contains 10 brilliant episodes with 205 different levels. And more and more terrific levels and adorable characters will be added periodically.